Prana Hot Yoga + Bodywork – OPEN HOUSE! 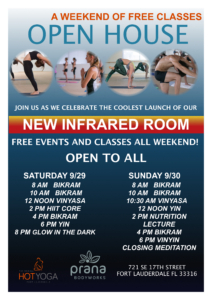 New Infrared room launch! Please feel free to contact us using the form below or by calling 954-523-0047. We are dedicated to teaching the curative method of Bikram Yoga in a manner consistent with the principals of the requirements of Bikram’s Yoga College of India. OPEN HOUSE! New Infrared room launch! – Original Hot yoga (Bikram style) with all the teachers we love! creating maximum health in the body and mind vs just plain old fitness. BUT when you’re healthy you’re probably quite fit! a complete sense of physical, mental, and emotional well being. This is exactly what a powerful yoga practice creates for you.